This shows three days of throughput on reads or writes (doesn’t matter what it is, can’t remember), spanning 15th to 17th of May. The blue line is the actual usage, averaged over 5 minutes. The red line the provisioned throughput. 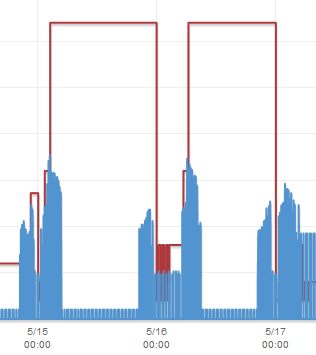 I configured Dynamic DynamoDB to double the throughput if needed, which is why the red line jumps up like it’s doing. The first thing to note: The provisioned throughput stays up there almost all day before dropping down again at midnight. Then there’s a frantic up and down scaling period just after midnight (easiest to see in the middle) before it eventually goes back up and stays there again till the next day at midnight again. That explains the reason why the throughput was stuck way too high till midnight: Dynamic DynamoDB had used all 4 downscaling options already, so even if it wanted to scale the throughput down, it had no way of doing that. This isn’t good. Now I’m not saying Dynamic DynamoDB isn’t a good tool, it was even mentioned on the AWS blog. It’s simply not fitting my use case patterns. At least not as far as I could figure out from the configuration options. If you have a lot of data, a single table gets split into multiple partitions. At that point your provisioned throughput gets evenly divided between those partitions. Also, and this is something it would be nice of AWS to improve, there’s no easy way of figuring out how many partitions you have. You sort of have to guess a little. If you therefore have a use case where only a single or a few keys are accessed a lot, your actual throughput is going to be below that of the provisioned throughput if these end up making one partition more accessed then the rest. We will have to rely on other statistics to figure out if that’s a problem for us. I am considering writing this tools myself, scratching my own itch. However, I’d prefer not to have to spend time on it. If anyone knows of any existing tool that would take these feature requests into account, I would really like you to leave a comment. Also, if you have any other features I’ve missed but you think is crucial, let me know!